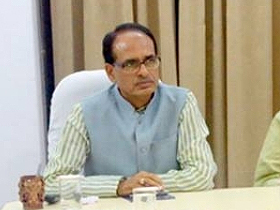 Chief Minister Shivraj Singh Chouhan said that the prime objective of Narmada Seva Yatra is to spread the message to every person for river conservation, cleanliness and environment protection. He said that the yatra has achieved its success and awareness has been brought for river conservation across the state along with people living on both banks of Narmada river. CM Chouhan was addressing Jan Samvad programme during 'Namami Devi Narmade' - Seva Yatra today in village Chhaktala of Alirajpur district. 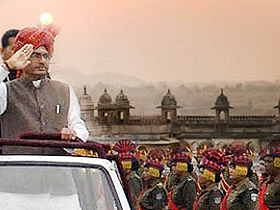 Chief Minister Chouhan said that the campaign is for enriching the ancient river and lifeline of the state. It was necessary for the success of the campaign that there should be public participation. Narmada river has given everything to the state. In ancient scriptures, Narmada has been described holy river like Ganga. This is giving salvation and life. He said that because of tree felling on the banks of the river, seepage has stopped in the river which used to be from trees there. We all will have to contribute for its protection and conservation. Chief Minister Chouhan said that trees providing shadow and fruits will be planted on both the sides of the river in one km radius. The farmers, who will plant fruit-bearing trees on private land, will be given Rs 20,000 financial help. Three years after when the trees will provide fruits, fruits routes will be developed. Toilets are being constructed in each house in villages on the banks of Narmada for making river banks holy and cleaned. Treatment plants are being installed to curb flow of drainage water. Liquor shops located in five km area from Narmada bank will be closed down after March 31. Steps will be taken for prohibition in entire state. He administered resolution for de-addiction completely and called upon village masses not to cause dirt in Narmada river. Crematorium would be constructed for last rites to be carried out in Narmada river. Changing rooms will be constructed at each Ghat on the Narmada river. Referring 'Beti Bachao-Beti Padao' campaign, the Chief Minister said that legal provision will be made for capital punishment to accused involved in atrocities with girls. The government will make efforts in this regard. Yoga Guru Baba Ramdev said that a Patanjali school will be opened in Alirajpur district in which 2 thousand children will be given admissions. Also products of farmers who wish to establish aloe vera, anvala (gooseberry) and herbal plants will be purchased by the Patanjali. Baba Ramdev said that addiction is the root cause of destruction. Addiction destroys human body. He also taught merits of yoga from the dais to the citizens present on the occasion. 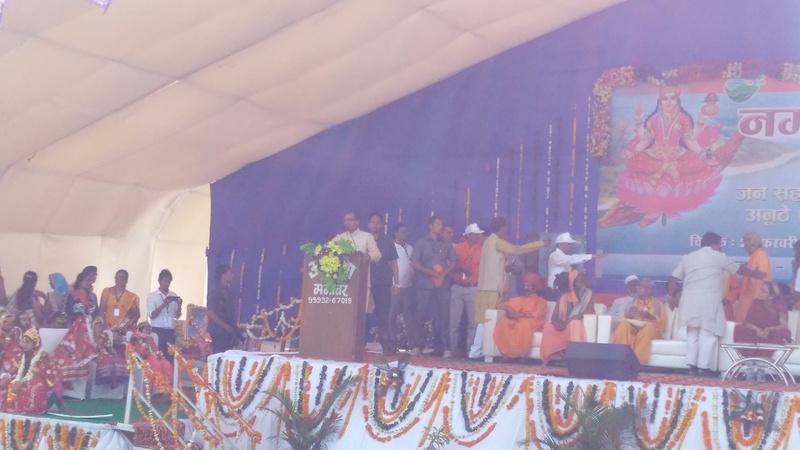 CM Chouhan announced to bring Narmada water through pipeline in village Chhaktala. He said that renovation of Kajal Mata Mandir which is a center of faith and devotion will be carried out. Also beautification of mandir will be undertaken. Shri Chouhan begun Jan-Sanvad programme with Kanya Poojan. He performed poojan by washing feet of the girls on the occasion. Earlier to this, CM Chouhan along with his wife participated in Narmada Seva Yatra at village Chhaktala. Smt. Sadhna Singh was holding Narmada kalash and CM Chouhan was holding Narmada flag. Baba Ramdev, Jain Muni Lokesh Muni, Chairman Madhya Pradesh Mineral Development Corporation Shri Shiv Choubey, Vice President Jan Abhiyan Parishad Shri Pradeep Pandey, Shri B.D. Sharma, MLAs Shri Nagar Singh Chouhan and Shri Madhav Singh Dabar were present in the yatra. Citizens, women and children in large numbers of Maharashtra and Gujarat borderline Boorma, Kavda, Gaampur, Jalbath villages and Sondwa tahsil of Madhya Pradesh were present in village Chhktala. 'Namami Devi Narmade' Seva Yatra was accorded grand welcome at Bhopaliya, Kathwad, Madhu Pallavi and Silota villages. The next destination of yatra is village Umrali.